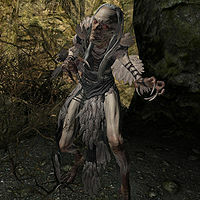 The Glenmoril Witches are five unique hagravens living in the Glenmoril Coven. During the Companions quest Blood's Honor you will be tasked to retrieve at least one of their heads for Kodlak Whitemane. They all possess the same spells, which include Fast Healing, Fireball, Close Wounds and Firebolt. They drop typical hagraven loot including hagraven feathers and hagraven claws. They also drop their heads, which when thrown into the Flame of the Harbinger in Ysgramor's Tomb allows a Werewolf to be cured of lycanthropy through the casting out of the Wolf Spirit from their soul. This page was last modified on 15 November 2016, at 03:11.